Being so much in love with the Romantic and Victorian poets, the professor himself didn’t try to open his students’ eyes so wide towards Modernists. As a result, if one doesn’t put extra-efforts on his own to know what kind of poems modernists composed, there is a big tendency to take the above statement for granted. When one indulges in the readings of modern poetry, the reason why modernists broke away from the traditional ways clearly makes shape. Anyone involved in a creative endeavour needs to proclaim his freedom of thought unrestricted by themes they deal with and forms that may not suit their voices. Haile Bizen with his “Bdihri Ma’etso: Hiruyat Qnyet” appears to declare the freedom of his voice unrestricted by form that is common and widely used in the country. 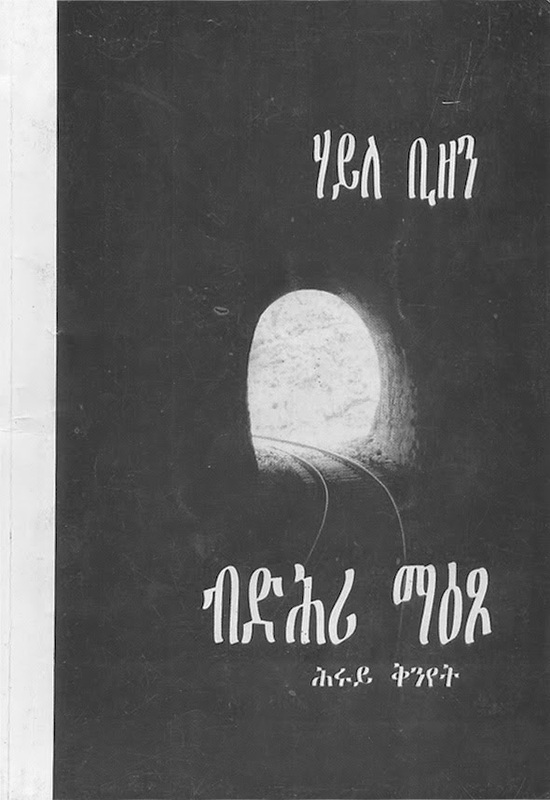 Haile titled his poetry book “Bdihri Ma’etso: Hiruyat Qnyet” (“Behind a Door: Selected Tunes”). He calls his ingenious creations ‘tunes’, not poems. Therefore, reciting the 68 selected ‘tunes’ requires one to vocalize the melodies that could emanate from the form they are composed in. The ‘tunes’ touch on many diverse topics. Some are dramatic monologues of inner feelings and introspection of human deeds and characters, also stages in human life; some deal with the sufferings of the Eritrean people under colonization; some are on places that are of national pride and beauty; and others are about heroism and sacrifices. This ‘tune’, in addition to intensifying the feeling one experiences in a quiet place by juxtaposing quietness with loudness, it creates visual and auditory images in the mind. Here, Haile’s craft starts with richness from its title using oxymoron figure of speech. As stated above many of Haile’s poems reflect the bitter colonial period that the Eritrean people went through. Each of them is no less than the others. Weki, Shi’eb, Agordat, Onna and Massawa are some of the many Eritrean villages and towns that sustained the merciless hands of Ethiopian colonization. Haile has composed ‘tunes’ to many of them. Weki, a village a few kilometres northeast of Asmara, is one for which his ‘tune’ with very few words passes profound meaning about what happened there. went to a single grave. Haile’s ‘tunes’ for various places of history and other important places are also full of imageries that quickly sink in one’s mind. “Teatro Asmara” personalizes the theatre hall as a young woman at her best and a masterpiece in itself whether it staged plays or not. “Compscitato”, downtown in Asmara, symbolizes as warmth found after womb where everyone flocks there in the twilight. “Ane Habatsi” signifies Nakfa to have breathed life into man (Eritreans). “Emba Denden” gives the general setting of mount Denden where incomparable feats of heroism were accomplished. “L’eli Mqur Zmeqere” is about young Eritreans who joined the struggle for independence believing dying for the motherland as the sweetest of all sweet things. “Ab Qebrkhum W’ile” communicates with martyrs telling them that a mother letting springs of tears fl ow, a sister with hot smouldering tears and a young brother with an avalanche of tears pour inward; reading it placidly certainly make one imagine the flood of tears in Ghinda’e martyrs cemetery where the bodies of many fallen heroes was buried in 1995 (the year that the ‘tune’ refers). Imagists are also well-known for the use of assonance and alliteration, as well as diction that are colloquial but not artificial. Many of Haile’s ‘tunes’, however, lack these figures of speech — assonance and alliteration. His diction is, though, precise and sharp with poetic expressions that create clear and unforgettable images. In a number of his ‘tunes’, Haile has used mothers’ face to create such an image. Many of his words are contracted giving a voice that one can identify them with the way some people speak in daily life. This particular feature enables the ‘tunes’ to get easily achieved rhythmic music and enable one listen to the voice intimately. Ezra Pound, influential American poet and literary critic pointed out that imagist poems should revolve around this points: “1) Direct treatment of the ‘thing,’ whether subjective or objective; 2) To use absolutely no word that does not contribute to the presentation; 3) …to compose in the sequence of the musical phrase, not in the sequence of a metronome.” Keeping this in mind, Haile Bizen’s “Behind a Door: Selected Tunes” could be taken as a pack of ‘tunes’ with profound images making him an imagist poet. ፊልም “ትማሊ” — ታሪኽ’ዶ ልብ-ወለድ?